This incredible triple cd features the debut work of Norways revered Supersilent - featuring the lineup of Helge Sten (Deathprod), Ståle Storløkken (synthesizer), Arve Henriksen (trumpet), and Jarle Vespestad (drums)." Countless hours of studio recordings were trimmed down for this spectacular collection - sometimes difficult, sometimes playful and often stunningly beautiful, stretch the limits of both jazz and improvisation into another dimension. 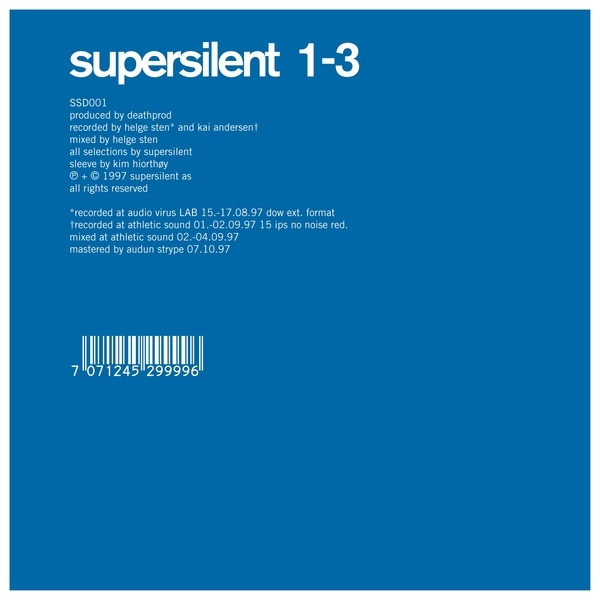 Supersilent 1-3 has been unavailable for quite some time and is now reissued in new deluxe fold-out digipak. Highly Recommended.